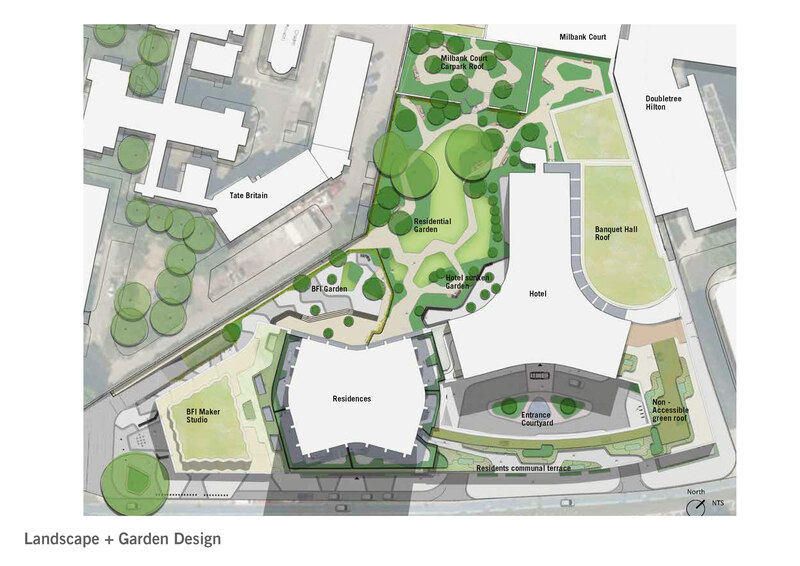 As a result of the garden’s design development more of the existing trees are to be retained and improved planting can occur as a result of a more efficient car park and service yard layout. This results in the garden no longer being largely an artificial landscape built on top of a concrete deck. Improvements to the public realm to the south of the building to create a welcoming entrance to BFI Millbank. BFI Millbank garden area designed to become a flexible, multi-purpose space. A genuine extension to the internal programme. The hotel garden area has been relocated and sunken into the landscape to ensure adequate buffering between itself and the residential garden.